Are you one of over 50% of denture wearers that can’t get their dentures clean using tablets? People of all ages want whiter teeth, but many denture wearers are still following the recommendation of their dentist from years ago. If you haven’t visited your dentist in the last few years, you are not up to date on the fact that most dentists now recommend Stain Away Plus®. 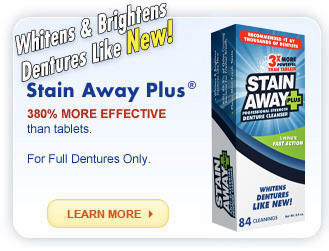 Stain Away Plus® Used by thousands of dentists in their offices because it is the most effective denture cleanser available. 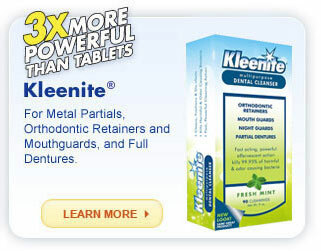 Guaranteed to remove years of stain and tartar buildup that tablets do not remove. Shipping & Returns | Copyright © 2015 Regent Labs. All Rights Reserved.